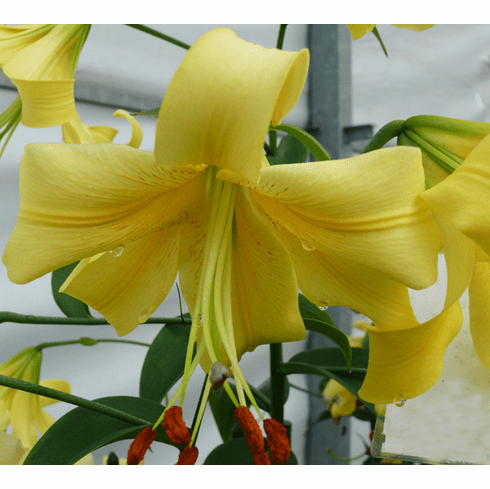 If you look closely into these medium sized golden-lemon yellow blooms, you�ll see just a light penciling of crimson red accents. Years ago, when first viewing 'Golden Condor' in trials, we were first attracted to how it reminded us so much of the Woodriff / Strahm lily 'Gold Eagle' of the late 1950's / early 1960's that was lost to commerce many years ago. Whereas 'Gold Eagle' had a tendency to lean, even in full sun, 'Golden Condor' has a much more sturdy stem. 3 to 4+ Feet average height, taller in shadier locations. Nice fragrance. Late July Flowering.